Hi, so glad you stopped by! I recently bought these patterned Pastel papers by Core'dinations. Aren't they pretty!? Just perfect for this challenge. I cut a lot of pieces because I wanted to use a variety of patterns and colors. On the one hand, I hated cutting a new piece for a little butterfly, but on the other hand, why have the paper if I'm not going to use it!? You know what I mean, I'm sure!! The other "new" recent purchase I used was My Creative Time's Hello Chickie die and stamp set. Isn't that little chick so adorable? Here's the card opened. It's actually a birthday card with a springtime/Easter theme. I even covered the back this time because my card base was white, and since it's so easy to do with this Sizzix flip-it die. Hope you'll join in the color challenge this week. 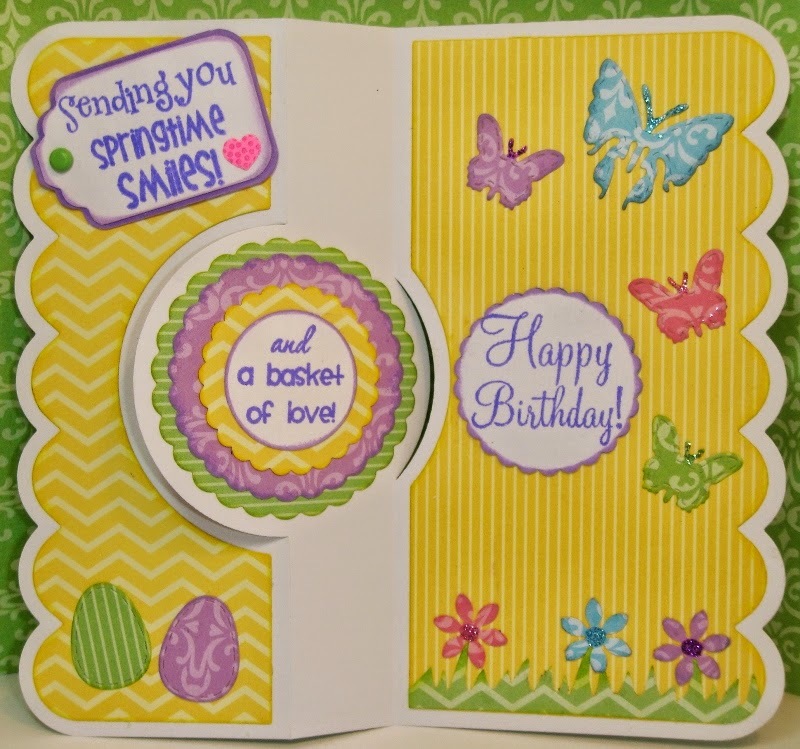 Use pastels in your card, layout or altered project and be sure to use a die cut. Link your post back to the Die Cuttin' Divas blog. We hope to see you there! Super cute! love that paper pad! What a adorable card!!! Love the papers you used!! Have a great day. Hi Pat! This is absolutely ADORABLE! I couldn't resist stopping by to tell you how cute this, and to invite you to stop by and share it with us in our challenge at Word Art Wednesday. We would LOVE to have you join us! I really like swing cards. This one is no exception. Great use of patterned papers, even though you had to cut into fresh sheets!! Thanks for joining our Easter challenge at Cut it Up! Oh what a beautiful swing card!! The patterned papers are just so gorgeous!! Super cute card. Lovely design. Thanks for playing at RCS. 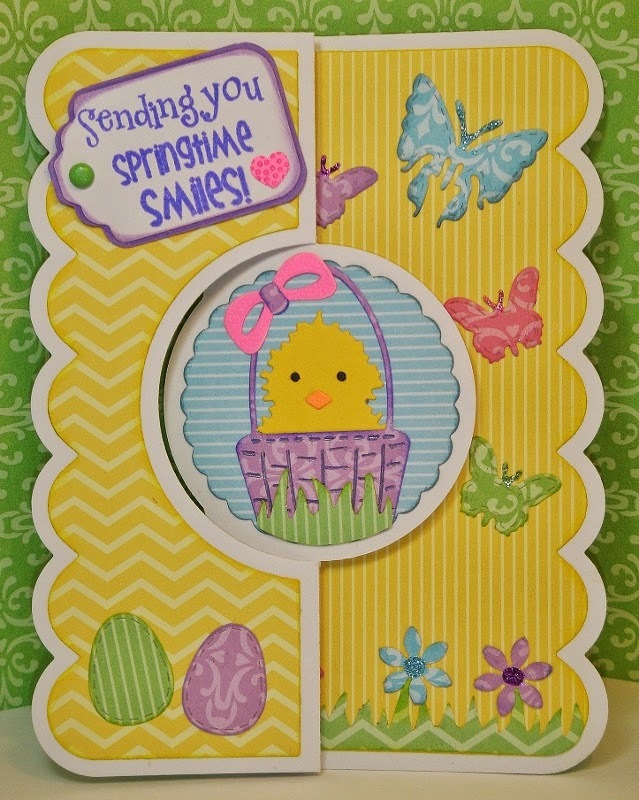 What a fun, bright, and happy card! Love the swing element and you even did the back...awesome! Thanks for sharing your work over at Red Carpet Studios! Super cute card! LOVE the papers and the swing fold is so fun! Perfect Easter card! Thanks so much for sharing with us over at Cut It Up and Craftin' Desert Divas! This is such a cute flip card!!! 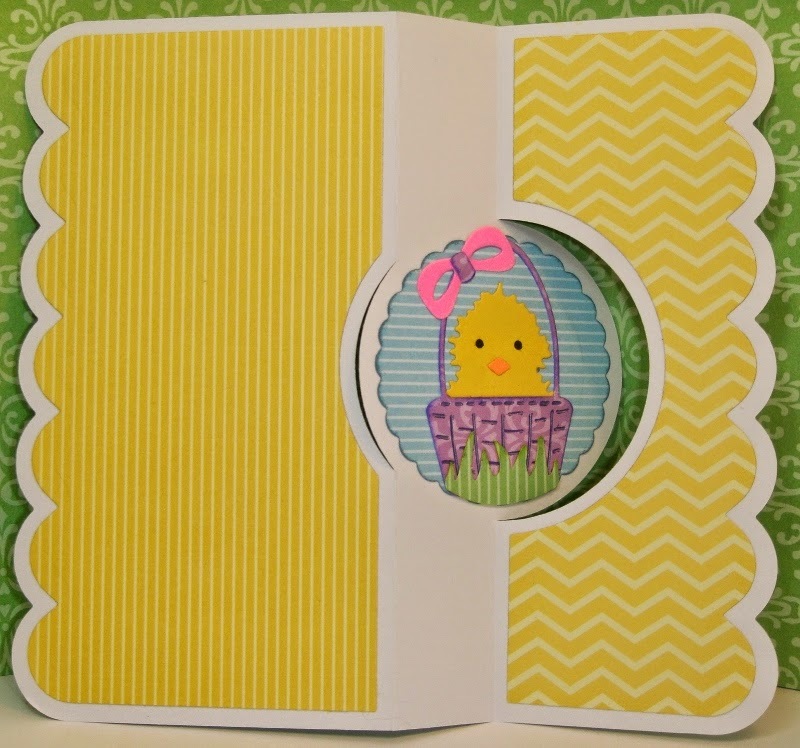 Love all your papers, the little chick is adorable and all the butterflies are so pretty!! !